Prayer is a way of reaching out to God or the higher divinities or your own transcendental self. It is a bridge by which you can get in touch with the most sensitive and devotional aspects of your own personality. Through prayers you express your love and devotion to God. Your prayer may be entirely your own creation, weaved by the love of your heart or taken from a scripture. In the Bhagavadgita God gives us the assurance that His devotees, who are immersed in the thoughts of Him and soaked by intense devotion to Him are freed forever from the bonds of mortal life. Prayers align our hearts and minds with the highest purpose of our lives, which is salvation or self-realization. There is no power in the world other than the power of prayer that can take us so close to the heart of God and connect us to Him in ways which we cannot even imagine. The power of prayer is such that even the gods as Indra, Vayu and Agni employ it when they seek the help of other gods like Brahma, Vishnu or Siva. We can change our lives and our destinies, using the power of prayers. Even the most difficult tasks can be performed with confidence when we unite the spiritual power of our prayers with the power of our intentions. Prayer as a method of worship is common to all religions. Other acts of worship that are closer to prayers in form and structure are hymns, incantations, curses and imprecations. Prayers may be spontaneous or formalized. They may or may not be accompanied by rituals. Devotees in every religion offer prayers to God in their own specific ways for reasons that are selfish or selfless. Religions do specify the way in which prayers ought to be offered. But those who are familiar with the practice know that purity of heart and sincerity of intention are far more important to a prayer than its mechanical or procedural as[aspects. Prayers not only purify the people who pray but also those in the vicinity. 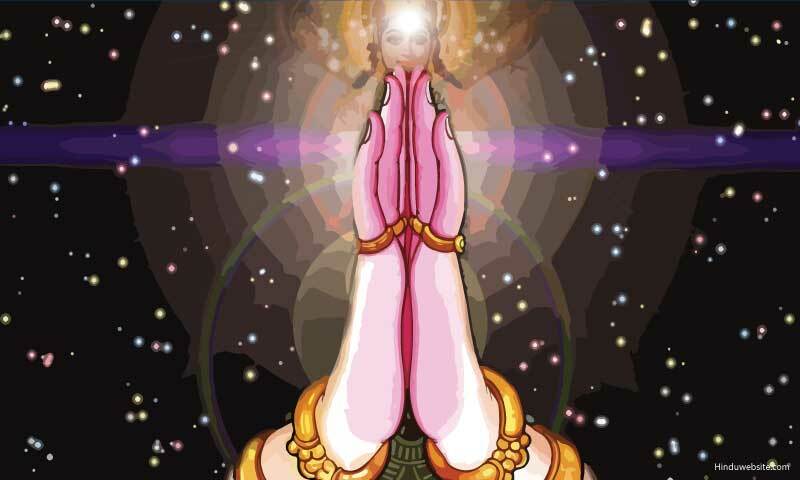 Prayers enable us to send out powerful vibrations into the world and contribute to peace and social harmony. One may pray loudly, but silent prayers are better. In silence, we come closer to God and make ourselves heard. We can ask for anything we want in our prayers. There is nothing wrong in seeking some material gain through our prayers. Some may argue that it is an inferior way of praying. But it is praying all the same. Praying is purely a personal act in which you establish a heart to heart communication with the object of your prayer. However, group prayers are believed to be far more effective, as several minds are joined for a common cause. When people pray together collectively, it makes them feel connected and socially responsible. It helps them to come together as a group to achieve their common goals and collective welfare. Prayer is a form of speech, which is infused with the power of devotion. Earnest prayers enter the subtle realms and create powerful vibration. If the prayer is from a sacred text, it will awaken the deity who is hidden in the words, who in turn propel the prayer to its destination. People generally pray with some specific motives based on the belief that if you pray sincerely you will get what you pray for. It does not cost anything to pray. No great preparation is required to offer a prayer. You can do it easily from wherever you are and in whatever condition or situation you find yourself. In prayers you combine the synergies of contemplation, concentration and devotion. Through prayers you augment the power of your thought with the power of God by uniting your mind with the universal mind and elevate your consciousness to step into the world of God. Our prayers awaken the dormant energies lying within us and make the impossible possible. In moments of exalted awareness induced by prayers, we even experience our oneness with our Creator. Most of us have seen or heard how people were cured of incurable diseases or overcame insurmountable problems through prayers. Many people have documented the occurrence of miraculous events in their lives because of prayers. There is nothing wrong if you pray for purely personal or selfish reasons. It is much better than not praying at all. When you pray, you remember God or think of Him, which in itself is very purifying and elevating. Sometimes society may not appreciate your reasons for praying, but it should not matter at all as long as your prayers help you in some meaningful way and do not harm you or anyone else. There is virtue in being humble and weak in front of God and ask Him for some favor with humility and expectation. Some people do pray to God for the destruction of others as self-proclaimed soldiers of God simply because they follow another faith or hold different beliefs. This is probably the most heinous crime that anyone can commit against themselves and the humanity. When a negative prayer is unleashed, it goes out into the universe to collect the negative energies lying there and returns to the one who delivered it to work through him with ruinous intensity to destroy his chances of entering the heaven. God is love in its purest form. As the indweller of everything, He responds promptly to every call and every pull of your love and need for help. In whatever way you worship, He returns your love and devotion. Nothing moves Him as strongly as a call from a distressed soul. If your prayers are not responded, it is not because God is unkind, deaf or dumb. Probably He loves you so much that He does not want you to get hurt in some ignorant or stupid way by seeking the things that are harmful. Probably He wants you to learn some lessons or think about other means or alternatives. As the knower of all, He is the best judge of everything. There is an irony in the fact of life that most of the things we covet are actually harmful. Wise men who have contemplated upon the truths of life know clearly why medicines are so bitter and why people who speak eloquently in election speeches or public platforms need not necessarily be men of great character. Men are seldom correct in judging their contemporary leaders or electing them because they see in them what they want to see rather than what they truly are and what they truly represent. Therefore, it is comforting to know that either explicitly or implicitly God responds to our prayers. This is the experience of many people in the present as well as in the past. He responds because He does not see you as being different or separate from Him. You are a part of His Body. You are an aspect of Him. For you He is God. But for Him you are inseparable. This is what God is. From His perspective everything is an extension of Himself. In truth, the experiences of countless individual souls are His experiences only. As the Hindu scriptures describe, God is ultimate enjoyer (bhogi) of all. As the silent witness, hiding behind a veil of mystery, He is in touch with every aspect of our lives. He permits the freedom of life to express itself through the exercise of our individual wills. He creates the laws of reward and punishment for Himself in His deluded aspect as individual souls caught in the web of deception and illusion. Whenever there is a genuine cry of help, He comes to the rescue of His separated selves. Ever present, ever active, He never abandons His numerous forms, be they human or animal, living or non-living. Actually, it is we who tend to forget Him or ignore Him most of the time because we are easily distracted by the myriad attractions of the external world. We remember Him usually when we need something or in times of difficulties. Even then if we pray to Him, if we approach Him sincerely and present our problems with faith, we receive His response. The doors to the heart of God are always open to sincere prayers. God's attention is riveted upon us. Everything happens according to His will. Both adversity and prosperity are His blessings only. We may like one and dislike the other. But for Him both are just tools. From a detached and spiritual perspective, the ultimate purpose of our lives upon earth is to experience life as it happens, unconditionally, without judgment and preference. Our prayers therefore ought to be spiritual rather than materialistic and sincere rather than superficial. God may respond to our materialistic aspirations also, since He is unbound love. At times we do feel that God has abandoned us and our faith is put to great test. We become frustrated that God's help has not reached us in time. On such occasions some people lose their faith and develop resentment towards God. Truly, the fault lies with us and our weak minds. It is not God who does not listen. It is we who are not sensitive enough to discern His response. It is we who are incapable of breaking out of our own limited thinking and the veil of self-induced illusions to see the Truth as it is. God is ever attentive. It is we who are asleep and who need to be awakened from our deep slumber of egoism and selfishness to pay attention to the messages coming from Him. In praying you have an opportunity to combine the best of both karma yoga and bhakti yoga. From a spiritual perspective, it is good to pray with the right attitude, for a righteous cause. Our prayers should be aimed for our spiritual welfare as well as the welfare of others. Equally important is to express love and devotion to God through our prayers with no particular aim or desire. Prayer is not a substitute for either hard work or diligence. A prayer is an act of worship. It has to be used as part of our spiritual effort to overcome our limitations and realize our true nature. A prayer which seeks to help others is the most effective and noble prayer. It has the ability to manifest God's power upon earth. It can heal the sick and purify the hearts. Finally, a prayer that is made without any expectation or without any desire for the result is the best of all.